We chose a cluster configuration, which suited them both. The Mum wanted a very traditional look, whilst her daughter wanted a ring that had a flatter, everyday-wear, character. We offered a number of design choices and the sculptural, twisted rope quality of one of our drawings caught their eye. By dropping a diamond, between each threaded twist, we were able to resolve the conflicting briefs: Moving away from a traditional, gallery-claw settings for the diamonds and instead, nestling them in a very fluid, sculptural rope form. 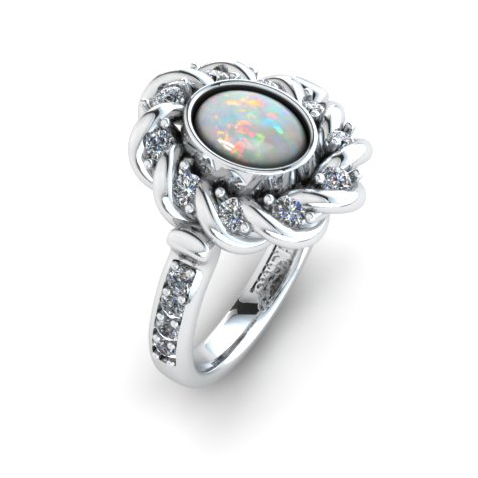 The beautiful oval opal was set into a simple rub-over frame. This type of setting serves two purposes: It creates a neat and secure case around the stone, whilst also protecting the opal better from impacts. The platinum opal and diamond rope twist ring was collected in person by our clients: They were both delighted with the ring!